HẢI PHÒNG — Police in Hải Phòng City have recently discovered a ring illegally transporting a large quantity of drugs from the northern mountainous province of Sơn La to Hải Phòng City. 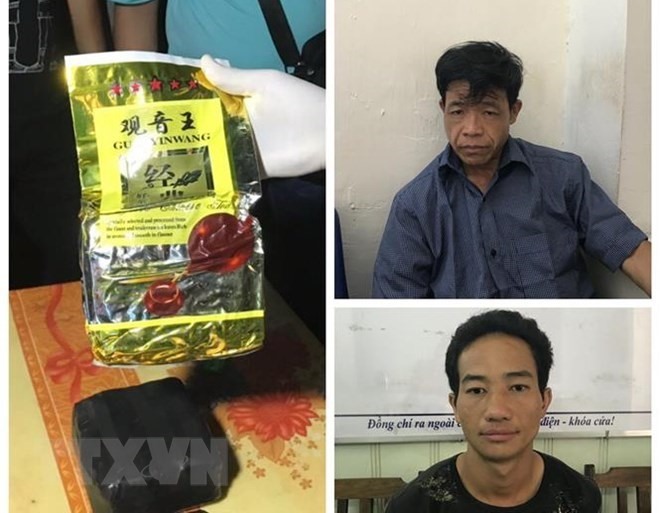 On Saturday, on the Hà Nội-Hải Phòng Expressway in the city’s An Lão District, the police arrested two people carrying drugs from Sơn La Province. The two arrestees are Giàng A Chớ, 50, residing Lũng Xá Hamlet, Lóng Luông Commune of Vân Hồ District in Sơn La Province, and Khả A Đàng, 29, living in Thung Mài Village, Hang Kia Commune, Mai Châu District of the northern mountainous province of Hòa Bình. The police seized 2.95kg of Methamphetamine, three cell phones, a car and over VNĐ7 million (US$290) in cash. The arrestees’ houses were searched by the police.